The 2010 Mitsubishi Lancer Sportback Ralliart. Mitsubishi will import a five-door version of its Lancer sedan this summer. The five-door will be a 2010 model and will come in two variants: a 168-hp Sportback GTS and a high-performance, 237-hp Sportback Ralliart. 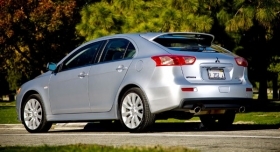 The five-door will offer slightly more cargo space than the Lancer sedan. The sedan was Mitsubishi Motors North Americas highest-volume vehicle in 2008, selling 27,861 units. In recent months, Mitsubishi has signaled its interest in moving to smaller vehicles. A clean diesel engine version of the Sportback now selling in Europe is under consideration for the United States, but no decision has been made, said a spokesman for the company in Cypress, Calif.
As with the sedan, the five door GTS will come with a 2.4-liter engine and either a five-speed manual or six-speed continuously variable transmission. The Ralliart version will carry a 2.0-liter turbocharged MIVEC engine with a CVT or a six-speed twin-clutch transmission. Pricing will be announced later this year.